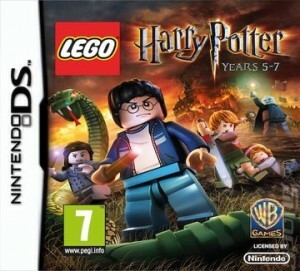 Once the cut scene has finished you will find yourself situated in Little Whinging Park as Harry Potter. Visit the slide to the right of the screen and use the ‘Wingardium Leviosa (WL)’ spell (Purple Orb) on the steps that are lying on the ground. (X2 Stud Multiplier Red Brick) – Climb the steps and slide down the slide three times (until the studs stop re-appearing). Go over to the sprung duck rocking toy and click the A button when shown, click the B button to jump off the toy. Then go to the merry-go-round and click the A button to get on it, rapidly tap the A button to make the merry-go-round speed up until Harry’s thrown off. Finally, jump on the trampoline and the X2 Stud Multiplier Red Brick will appear in the sand box. Now go to the swing and press the A button, use the Left and Right directional buttons to swing back and forth, keep doing this until Harry swings over the bar several times before flying off and leaving studs to collect. (Wizards Hat) – (Free Play Mode) Use a character that has a pet (Green Orb), I like to use Hermione Granger. Press the A button to turn into the pet and hold down the Y button to dig in the sand pit, this will release a ‘Weasley Wizard Wheezes Box’. Use a Weasley character, I like to use Ron Weasley, to open the box by pressing the A button, this will release a pair of sucker pads which Ron will put on his feet. Walk over to the climbing frame to the top-left of the sand box and walk up to the Green/Orange/Purple horizontal walkway behind the climbing frame. Ron will walk up the walkway. At the top of the climbing frame is a Wizards Hat. Go over to the large green hamster wheel towards the right hand side of the park. Use the ‘WL’ spell on the wheel to release some Lego bricks. Note: You can destroy the stand for more studs (Studs will allow you to unlock the ‘True Wizard’ award for each chapter and buy characters, extras and hits at the Hogwarts Castle). Use the ‘WL’ spell on the pile of Lego bricks left from the wheel, this will create a ladder so you can move on to the next area. Note: You can collect studs from destroying benches and bins (these are available throughout the entire game). You can also use the ‘Reducto’ spell (Gold Orb) on the see-saw to get more studs. Use the ‘WL’ spell on the black and silver bin, this will smash-up the car next to it, to create a pile of bricks. Use the ‘WL’ spell on the pile of bricks to create a bridge over the river, this will allow you to move on to the next area. Go back towards the garage at the top-left of the screen and destroy the wooden crate standing against the garage door, this will give you some studs. Use the ‘WL’ spell on the garage door to reveal more studs. (Petunia Dursley Character) – (Free Play Mode) Drop down to the river and use the ‘Lumos’ spell (Right Silver Orb) on the vines covering the gate, this will open the gate and let you gain the Petunia Dursley character. Now move across the bridge and change your character to ‘Dudley Dursley’ by pressing the X button in order to open the gate with the orange handles. Stand on the gold ring and press the A button to open the gate. Change your character back to Harry by pressing the X button again. Continue through the gate to the next area. On the floor are two car wheels, use the ‘WL’ spell on each wheel, you will need to use the directional buttons to direct the wheels towards to the broken car. Then use the ‘WL’ spell on the car to send it into the wall in front. Note: You can destroy bins to gain more studs. Jump on the car to access the level above, head towards the gap in the wall. Half way down two death eaters will immerse, one will follow Dudley and the other will stay to fight Harry. Use the ‘Expecto Patronum (EP)’ spell (Left Sliver Orb) to kill the death eater by holding down the Y button to target, when the target circle turns orange release the Y button. Continue this action to kill the other death eater which will allow Dudley to re-join your party. Switch character to Dudley again and press the A button to open the gate that the death eaters came from. Exit through the gate to enter the next area. Now you find yourself inside standing next to a red telephone box. Use the ‘WL’ spell on the telephone box to leave some studs. Note: There are loads of items you can destroy around the room to gain more studs. Use the ‘WL’ spell on the blue janitor’s cart to leave a few green Lego bricks. Use the ‘WL’ spell on the green bricks to create a chimney passage. Stand in the middle of the green ring and press the A button to transport yourself to the next area. Make your way towards the large fountain at the end of the corridor, destroying anything you can along the way for more studs. Head right of the fountain to find more items you can destroy for studs. Use the ‘WL’ spell on the bar stand to uncover more studs on top of the sun shield. Head towards the fountain and use the ‘WL’ spell on the red and black Lego bricks on the side of the fountain. Use the ‘WL’ spell on the tap you just created to turn the fountain off which will give you another pile of Lego bricks. Use the ‘WL’ spell again on the pile of bricks to create a plane which will enter the picture on the wall. The character in the picture will pull a lever, opening the large gold gates to the left. Before going through the gate, if you are playing in free play mode you can get the second wizards hat. (Wizards Hat) – (Free Play Mode) As you arrive at the large fountain, take a left and you’ll find a large gold gate with orange handles. Use a ‘Super Strength Character’, I like to use Hagrid or one of the Dursley’s, to pull the handles by pressing the A button. Behind the gate is the second Wizards Hat. You will find yourself in a classroom next to a cauldron. As you go around the room you’ll see items that you can interact with. (Wizards Hat) – Going around the room clockwise you first come to a brown window shutter, use the ‘WL’ spell on the shutter to open it. There are five shutters around the room, open them all to gain the Wizards Hat. Go back to the first shutter you opened and shoot the cobweb on the wall to get the first piece to go into the cauldron to create the ‘Strength Potion’. (Professor Umbridge Character) – Next shoot the horse underneath the second shutter three times to get the ‘Professor Umbridge’ character token. You can now practise using the ‘Lumos’ spell on the green vine to gain studs, plus shoot the stack of books for more studs. Head to the top of the room and use the ‘WL’ spell on the dinosaur pieces on the floor to fix the dinosaur’s head. Then use the ‘WL’ on the chest to gain the second item for the ‘Strength Potion’. On your way back to the cauldron you can destroy the front two tables and the black board for studs. Once you have put the item in the cauldron you can use the ‘WL’ spell on the pile of books and shoot them for more studs. Use the ‘Reducto’ spell on the stack of weights holding the cage which contains a little blue creature. Once the creature has been released shoot him with the ‘Reducto’ spell before he kills you. He will release the last item of the ‘Strength Potion’. Press the A button next to the cauldron after you have added the last item and then follow the studs to the cabinet on the right. Stand on the gold ring and press the A button to open the cabinet and Lego bricks will fall out. Use the ‘WL’ spell on the bricks to create a plane/bird, this will reveal a blue platform. Stand on the platform and press the A button to finish the chapter. This entry was posted in DS and 3DS, Games, Lego Harry Potter Years 5-7 on January 15, 2012 by Tasha.